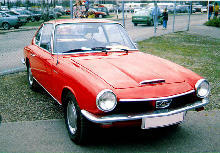 The 1300GT was a very pretty car, designed by Frua, powered by an inline 4 1290cc, single overhead cam engine. Later the 1300 was beefed up and available as a 1700. In 1966 the cars had a facelift and in which the round headlights were replaces by sharper rectangular lights, the lines of which created a more angular wing profile too. Production lasted until September 1967, with almost 5400 cars produced, roughly 2/3 with the 1300 cc engine. Glas became part of BMW pretty soon after with the Glas 2600 GT being produced as a BMW and later beefed up to 3 litres with the 3000GT, essentially the design was the same but with BMW badges, if you line up the BMW cars from 1967 together you'll notice one stands out from the crowd, the Glas.